Emoji have become such a ubiquitous part of the contemporary vernacular that it’s possible to recreate entire movie plots using them. And while it might seem obvious there’s a generational divide when it comes to emoji use, it’s not so apparent that there’s a geographical one as well. But by analyzing cloud data from its users, popular keyboard app maker SwiftKey complied a detailed US Emoji Report to take a deep dive into emoji use by state. The map is a little deceptive at first glance. 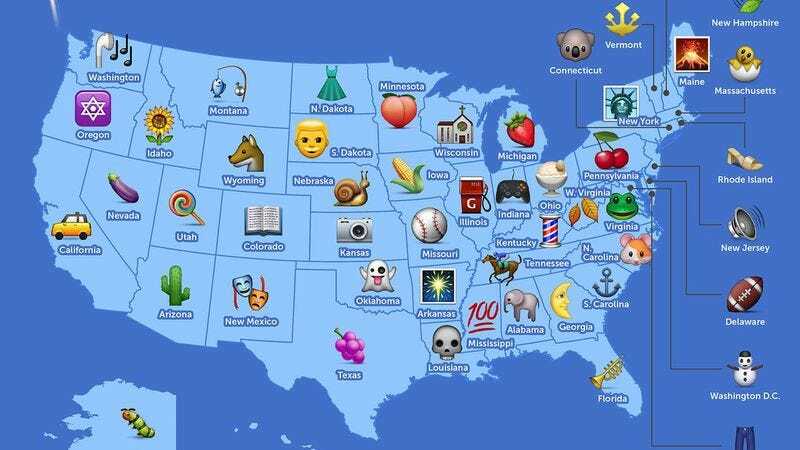 It doesn’t necessarily list the most popular emoji in each state, but rather the emoji that each state uses more than any other state. Presumably, people all over the country use a thumbs up to show agreement, a heart to show love, and the pointing/OK fingers to show you-know-what. But New York understandably talks about the Statue of Liberty more than any other state, while Arizona is more fond of the cactus than most. In fact, plenty of these make sense: Iowa talks about corn a lot, New Hampshire likes breezy leaves, and Hawaii has a lot of surfing to discuss. But others are far more unusual. Why does Alabama use the elephant more than any other state? Why are Minnesotans texting about peaches (or butts)? And since when is New Mexico a hub of theatrical entertainment? The site’s interactive map offers even more detail, but, unfortunately, no answers to questions about Connecticut’s koala use or Florida’s obsession with trumpets.